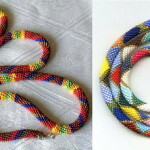 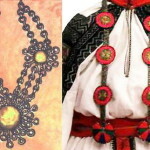 Kolodochka (tow) – tightly-woven beads or chain that simulates body of a snake. 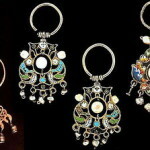 Widespread in Kaluga, Ryazan and Tula, as an ornament for girls and young women. 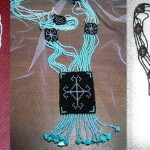 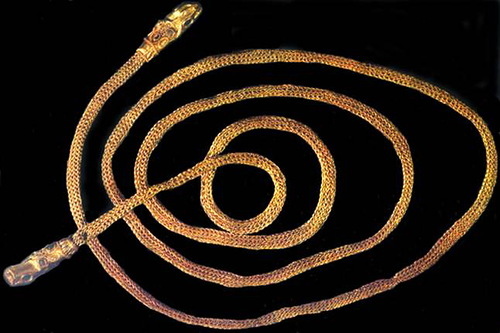 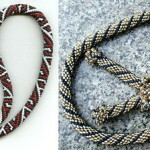 And Lariat (coil, snake) – this is the long version, served as beads, or a belt. 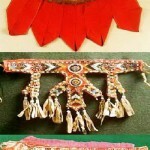 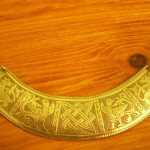 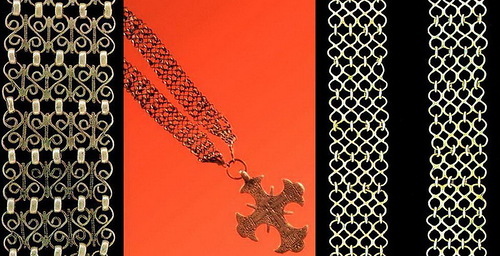 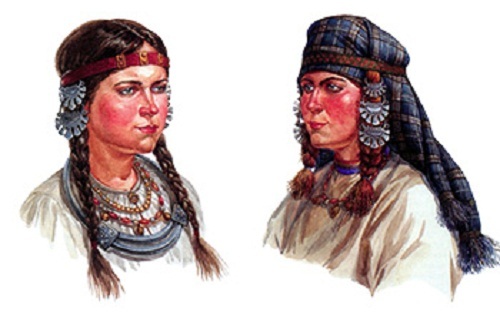 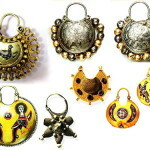 Gaitan (Gerdan, Ethan, Gita, koroleska, pochepka, chapochka) – breast, sometimes back decoration, made first of twisted metal rings, like a chain with a cross or an icon, then added artful weaving out of beads or threads. 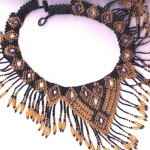 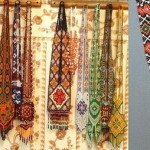 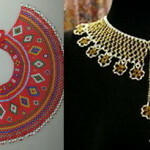 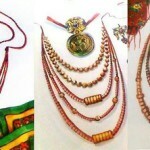 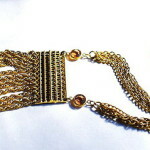 Now, Gaitana are long (up to waist), width of 10 cm, a strip of beads. 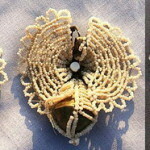 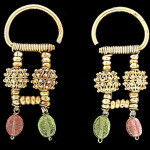 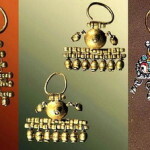 The two ends are connected with glass beads suspension with ornament – a medallion beaded tassels, in ancient times with “vstavaranka” (bones from the chicken wing). 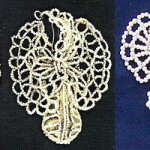 Butterflies is a metal rod with two blades, delicate, braided with pearls in the form of a butterfly’s wings, strung on horsehair or thin wire and attached to the bottom of the teardrop pendants or bell. 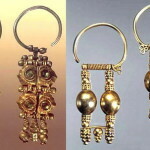 Metal base made ​​mostly of brass – an alloy of copper and zinc and other elements, the shackle made ​​of silver. 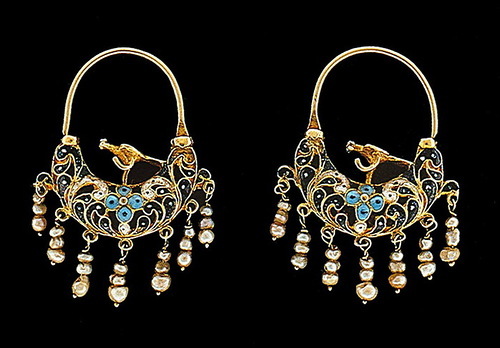 The shape of pearl earrings formed by the end of XVIII century. 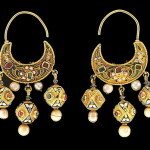 In the XIX century, became a substitute for natural pearls, pearl beads, and glass beads. 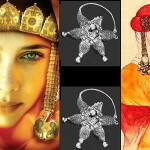 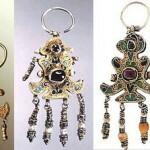 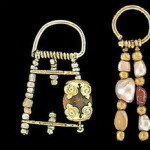 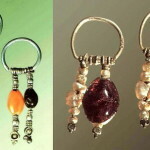 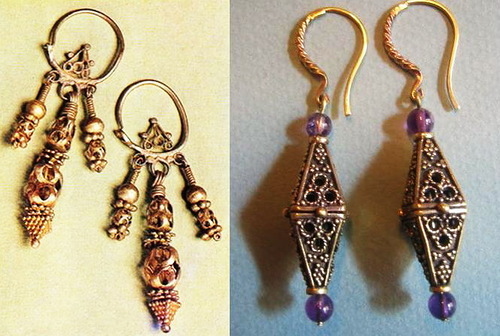 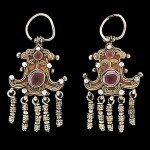 Odintsy, dvoychatki, Triad – came about the XV century, hanging earrings with 1, 2 or 3 rods with carnelian, bone, mother of pearl beads or cylinders, beads, pearls. 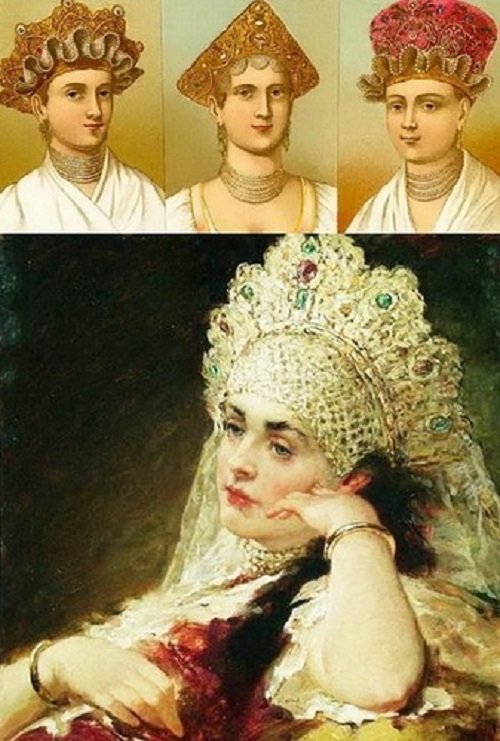 Were common in Kaluga, the northern and central parts of European Russia. 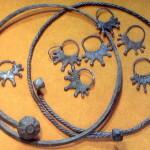 Pyasy – approximately XIV, massive suspension on the Shvenzy ring with bells at the bottom. 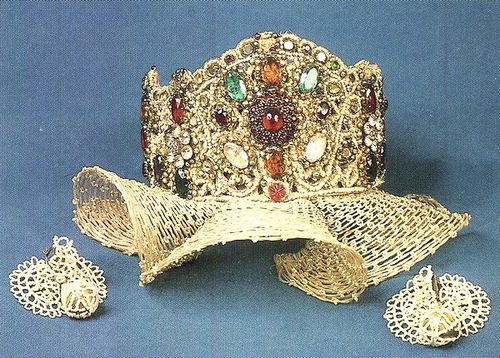 Shvenzy ring was attached to the tapes or headgear, or fastened to the ear. 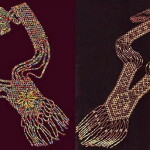 Later, they were made of beads. 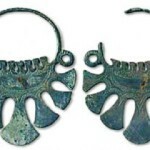 Known since the Bronze Age, but in the 13th century, began to withdraw from circulation. 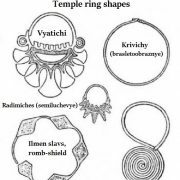 The shape of the rings can identify tribe to which they belonged, and the owner or the area in which she lived (the union of tribes).